Mass I, Mass VIII, Mass IX, Mass XI and XVII. We welcome all men and boys who have received their first communion to serve at the Altar during Mass. While some altar server roles require a large amount of responsibility, there are numerous roles that are well suited to the beginning server. We encourage any interested men to talk to Mr Perkins or Fr. 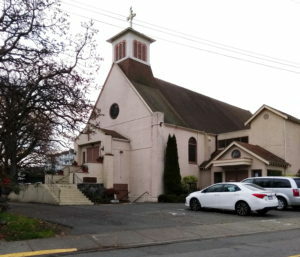 Domotor after Mass. Ideally (but not necessary) one will have a general understanding of the order of the Mass and know the server’s responses in Latin. This guide might be appear overwhelming to a beginner but we feel it strikes a good balance between conciseness and accuracy. See here for an alternate. We typically have a Sung High Mass on Sundays (without deacon) and Low Masses (with two servers) on other days of the week. 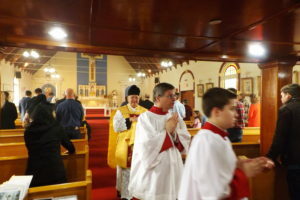 Roles typically required during Sunday Mass in acsending order of difficulty are: Crucifer, Torch Bearer, Incense Bearer, Thurifer, Second Acolyte, First Acolyte, and MC.